We make people aware of the threats to red squirrels. We work with our members and volunteers, local communities, other groups and conservation organisations to eliminate these threats. This way we will ensure that red squirrels remain an intrinsic and valued part of our landscape, enhancing biodiversity and sustaining our cultural heritage for generations to come. Our founder-members were working as red squirrel conservation volunteers from the early 1990s with the Red Alert programme and, later, the Save Our Squirrels initiative. The Society was formed in 2005 and in 2011 we became a charity. Our strength lies in our growing network of members, volunteers and supporters who come from throughout Cumbria and further afield. We can save our red squirrels, but we need everyone to do what they can to help – financially and practically. Individuals, families and businesses are all welcome to join as members and we appreciate those who can spare some time to become more involved with our work: having a trap in their garden; helping to run the Society; and trapping, shooting and recording. All this helps, as well as do those who support us with their membership subscriptions and donations. We value excellent support from large landowners – their contributions are crucial. Local business sponsorship is also vital and much appreciated. Importantly, we also receive practical and financial help from conservation organisations such as the Lake District National Park Authority, National Trust and Red Squirrels Northern England; this partnership-working is an essential piece of the conservation jigsaw. Our funding, over and above the money we receive from members, donors and sponsors, has traditionally come from the sale of items such as calendars, cards and key-rings, mainly at country shows and other events. We continue to rely on these sources of income and as a charity we use charity collection boxes in shops and benefit from Gift Aid. Volunteers do all our administration, keeping costs to a minimum. We have no paid staff or premises. Some of our spending goes on essential public liability insurance and on promotional and educational material. But we spend the bulk of our income on grey squirrel control, without which our red squirrels would not survive. We are always on the lookout for grant funding to accelerate our work, although this can be difficult to obtain and is usually short-term. 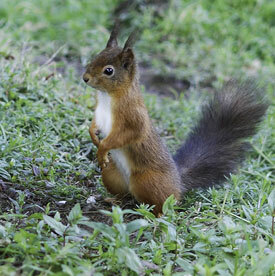 Red squirrels bring economic benefits to the local economy, in particular to the tourism sector. As these benefits are recognised, we aim to increase local business sponsorship. With falling grey squirrel numbers, and more local community involvement, our funding requirements should reach a level which is sustainable over the longer term.